Barry Allen aka the second Flash, is more known for his death and his legacy than his superheroics. While I enjoyed Johns’ Rebirth of the character, I know it won’t be the Barry Allen story I’ll recommend to a first time Flash fan. Barry Allen needs this story more than we do. This isn’t about a fan pleading for Geoff Johns to step away from Barry Allen and bring Wally West back. This is a fan wanting the best Barry Allen story possible told. Besides, how many times have been told or told yourself that a story will “read better in trade.”? THIS IS THAT STORY! – Critical recognition: Praised by fans and industry alike. – Dynamic storytelling: the ability to tell a story unlike any other. Generic need not apply. – Superhero experience: This means no crime novel experts or Twilight authors. Sorry Scott Snyder! So who fits these ideals? Well I’ve come up with a shortlist, and we’ll select from there. -Geoff Johns: Probably the third most famous man in comics behind Bendis & Liefield. 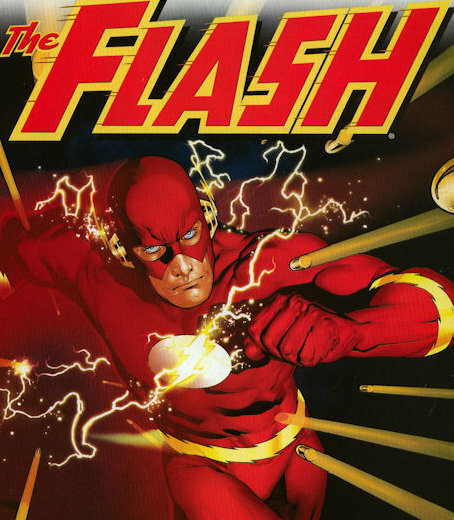 He’s a consistent top seller at DC, and is the author of my personal favorite story, The Flash: Blitz. While speedster versus speedster may not be revolutionary, it was pretty entertaining. And he’s got tons of superhero experience under his belt…he doesn’t write anything else! -Kurt Busiek: The man has written every major superhero character in the business in some fashion and actually did well with the majority of them. From Marvels to JLA/Avengers, Busiek is regarded as one of the best. And here’s the kicker, he’s never REALLY touched The Flash! -Grant Morrison: Probably the most polarizing writer in comics since Alan Moore went…elsewhere…Morrison has reputation for the weird and known to think outside the box. He’s got a classic Superman story under his belt, a Batman epic still running and rumors of a Wonder Woman project are forever buzzing. He did write The Flash(Wally West) in his highly acclaimed JLA book for years. So which one of these writers is the best fit for the perfect Flash story? Congratulations to GRANT MORRISON. Grant has the ability to make Barry Allen a lot more interesting than he has ever been. I also tend to think that Grant is a modern master at creating characters. This is Earth One, not a new #1 issue. There’s no rule that says Captain Cold must be the villain…sorry ROGUE, behind it all. Imagine a flurry of Flash villains and rogues that would fight Barry Allen like the fresh characters Morrison has built in the recent Batman and Robin issues. -Dynamic style: Nothing generic. Something everyone will like but more importantly something we’ll appreciate. -Prominence: Shane Davis & Gary Frank are not the most famous artists in comics, but they are generally well received. Our chosen artist should be the same. -Unfamiliarity: Earth One should be something we’ve never seen before. Show us something new. No Howard Porter’s Wally West. No Scott Kolins, Francis Manapul or even Andy Kubert. I’m sure you have picked out your 3 artists who fit these qualifications already, so let’s find out if we’re on the same frequency. Are your arms up in the air over my selections? Probably. Do you hate me now? Probably, but that’s what the comments section is for! On to the selection of our artist. Please congratulate the amazing RYAN SOOK! The man can do lighting like no other. Every scene that I have seen from the man is packed full of emotion. What I like most about Sook for this project is the way he makes every panel so tight. The “camera” is always where it needs to be. No ridiculous angle that doesn’t contribute to the story. Its the simplicity of the angles that make all those details in scenery and character expression look so vivid. So with Morrison and Sook, “THE FLASH: EARTH ONE” is booked. Now where do we go from here? Well since this isn’t a DC Comics creative board meeting, I leave you with a few pieces of art from Ryan Sook that helped me make my decision. Also, check out Seven Soldiers: Zatanna or Return of Bruce Wayne #5 for some Morrison/Sook awesomeness. I’d like to see a Flash: Earth One book but hopefully it would have a writer that we’re not used to seeing on Flash or one that hasn’t written him before. Flash: Rebirth and “The Dastardly Death of the Rogues” were both poorly written and executed, IMO. I think having someone other than Geoff Johns (or Mark Waid) take a crack at this would be interesting. Put it in the hands of Keith Giffen or someone and see if they can bring something new to the table. Morrison? Hell yes. Sook? Sure I guess. I’d Rather see Darwyn Cooke or Karl Kerschl, but Sook could work. An update of Barry’s early history would hardly be a bad thing. Maybe it would make a believer out some of the haters. I thought about Cooke, but went against it because I wasn’t huge on his take on The Flash. Something about seeing those heavy eyebrows through the mask just doesn’t sit right with me. Sold! Don’t forget, Morrison and Millar wrote The Flash for a year when Wally was headlining and Waid went on sabbatical! And I LOVE Sook’s variant cover! JH Williams has PHENOMENAL art, but I think it’s too dark for the Flash, and besides, his talents are needed on Batwoman! I would buy the Earth One you described in a flash! That “Iris West” piece isn’t by Sook. It’s by Nelson Blake II. But I wholeheartedly agree that Sook would be a perfect match for FLASH: EARTH ONE. He needs to be on a monthly book, anyway! His covers for Top Cow are stellar, but I’d love to see more of his interior work. For the artist, I’d want to see Kenneth Rocafort. He’s the artist on Velocity, and holy raptor Jesus can this man draw speed lines. And speed scenes. And…spandex. 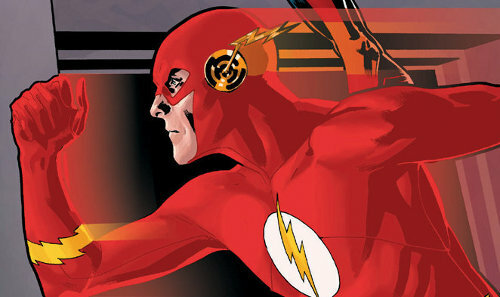 If Flash: Earth-One was going to become a reality, I’d pick this artist over pretty much any other. Except maybe Darwyn Cooke, because his (oddly brown-eyed) version of Barry in Justice League: New Frontier was one of the most dynamic renderings I’d seen in a long time. You know that variant cover he recently did for the new Flash series? I cried when I realized that I didn’t have the money to buy it without holding off on buying two other comics. As for the writer…call me biased (or please don’t, because I don’t always worship at her altar), but Gail Simone, please come work your magic. I’ve always wanted to see her write a speedster, preferably Bart or Jenni, but I’m convinced she could do a good version of Barry that isn’t a complete stick in the mud, but not such a far cry from the original that he’s completely unrecognizable but for the name. On a completely unrelated note, I’d always thought that the Earth-3 version of Barry Allen that never got powers would have been in the Mafia or something. I can totally see Iris as a corrupt journalist-slash-gangster’s moll.